Bikes on Greyhound. Yes or no? Let's see. As a cyclist, I’m also a traveler. Most of us are. We love to take our bike and see the world. Many times this means catching a long distance bus to get from point A to point B quickly. This allows us to spend more time cycling the parts of the world we love and less time getting there. For the Greyhound, you'll need to chuck your bike in a box. It can either be a purpose made bike box (not cheap) or one simply made from cardboard. 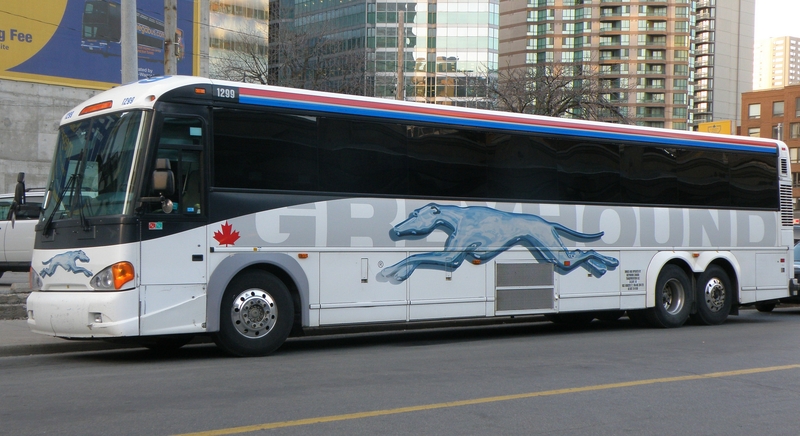 The Greyhound is one of the most common long distance travel buses in North America. They are easy to book and have stations all over the U.S.A. and Canada. In fact, there are over 3,800 destinations. It’s therefore vital that I know if I can take my bike with me when I travel on the Greyhound. The short answer is yes, but as always it’s more complicated than that. A quick search on Google will show that cyclists give Greyhound mixed reviews when it comes to accommodating our bikes. The Greyhound counts bicycles as oversize luggage. Oversize luggage costs $30 plus tax. Any traveling cyclist needs to bare this in mind. In addition, the Greyhound usually only takes bikes if they are packaged in a bicycle box (click here for dimensions). If you’ve never packed your bike in a box before you need to be aware of how long it takes and what the advantages and dangers are. If you don’t pre-pack the bike, then a box can be bought at some but not all Greyhound terminals. They cost $10 which brings your total to just over $40 not including tax. The $10 must also be paid in cash. You need to call ahead to confirm that boxes are available and leave time to pack your bike upon arrival. How quickly you can pack a bike into a bike box depends on the type, model and your own familiarity with this method. It takes some cyclists doing it for the first time several hours to complete. Touring bikes are harder to pack because of the longer wheelbase. Mountain bikes and road bikes should be much easier. If you can plan ahead, then call your local bike store and ask if they have a box and if they can pack the bike for you. Watching someone do it can help you pack faster next time. For an idea click here to see how to pack your bike into an actual bike box. Or watch the video below by the GCN to see how to pack your bike into a general cardboard box​. The short answer is quite a bit. Here’s a brief list of the usual minimum requirements. You then need to place the various segments of the bike together in the box with enough room to buffer for knocks and jolts that inevitably occur on any journey. Many bikers will stuff sleeping bags and other amenities inside the packaging as well. Make sure you have tape to keep parts in place, and material to place around the bike when it is packed. If this is your first time, I highly recommend taking it to a bike shop and asking them to pack it for you. Watch and learn as they go through the process. Whatever you do, don’t leave it to the last minute. What else can I expect traveling by bike on the Greyhound? If you’re traveling from Vancouver to Whistler or from Vancouver to Squamish/Garibaldi you can travel with your bike and not have to pack it! The former route has a $10 charge for this and the latter is only $5. Insurance on these routes only costs an additional $3. I would buy the insurance. Who knows what can happen on a journey, even a relatively short one? $3 is not expensive, and well worth the peace of mind. As with any journey, the key is to prepare. Always call ahead, check out the website and plan as far ahead as possible. Then you can be sure wherever you go, your bike will go with you.